A sprawling patchwork of a city, Cape Town is fast becoming the go-to destination for adventure-eager travellers the world over. Nestled within South Africa’s southernmost point, Cape Town has much to offer in terms of dramatic natural scenery, but it is its unique mix of cultural influences, architectural styles and local, sunny disposition that makes it such a draw for first-timers and returning wanderers alike. 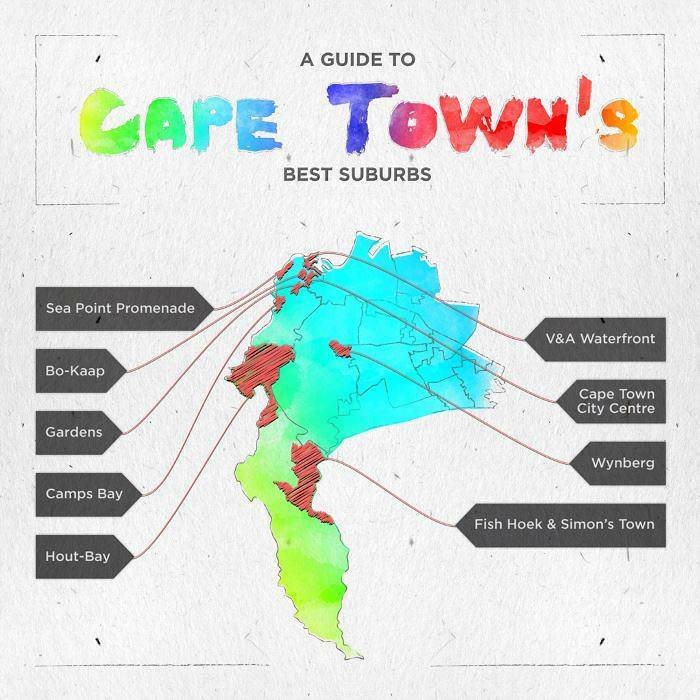 From the hyper-trendy, multicolour streets of Bo-Kaap and Woodstock, to the sleepy seaside atmosphere of Simon’s Town and Fish Hoek, all set against the majestic backdrop of Table Mountain, here’s our definitive guide to Cape Town’s best neighbourhoods. 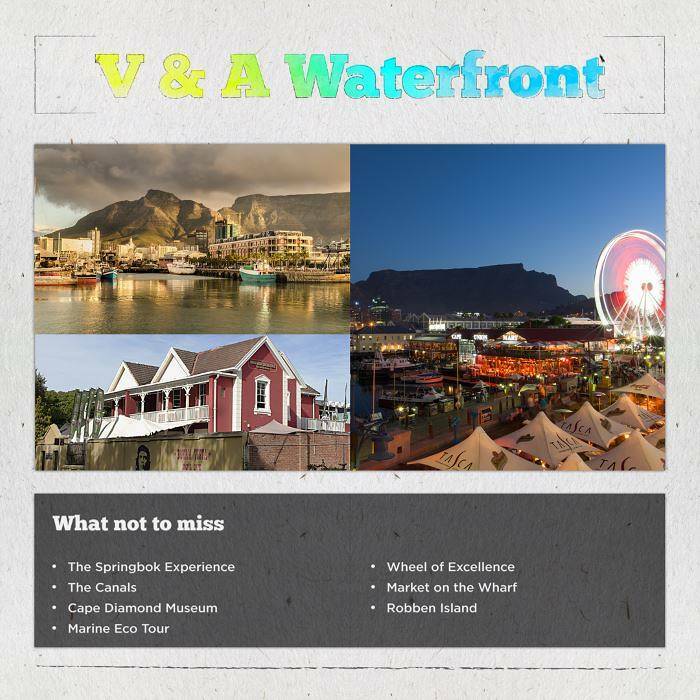 Nestled between Robben Island and Table Mountain, V&A Waterfront is the ocean-lapped jewel in Cape Town’s crown. From its humble roots as part of the city’s working harbour, the Waterfront was upgraded and refreshed in the 1970s and has been welcoming flocks of fun-loving visitors ever since. The area’s main draw comes in the form of its varied shopping and dining offerings, and many a Cape Town sun-down can be enjoyed from one of the Waterfront’s copious bars, overlooking the bustling, vibrant harbour. The Springbok Experience – Get under the skin of SA’s world-famous rugby union team in this comprehensive museum. The Canals Cruise – The sparklingly glamorous network of canals situated just north of the Waterfront play host to the glimmering holiday homes of David Beckham, Elton John and Madonna among others, and can only be explored by boat. Cape Diamond Museum – A deeply edifying museum, focusing on the history of diamond trade in Cape Town. Marine Eco Tour – Spot the Waterfront’s populations of dolphins, seals, whales and great white sharks on a boat tour of the harbour. Wheel of Excellence – The Waterfront’s most iconic attraction, this giant Ferris wheel is great for grabbing sunset views across the ocean. Market on the Wharf – A top destination for foodies, this open-air market is a coming-together of over 40 local vendors. Robben Island – One of the city’s most famed landmarks, the former prison that held Nelson Mandela captive is now a UNESCO World Heritage site, and is well worth a visit. Boat trips leave regularly from the Nelson Mandela Gateway. 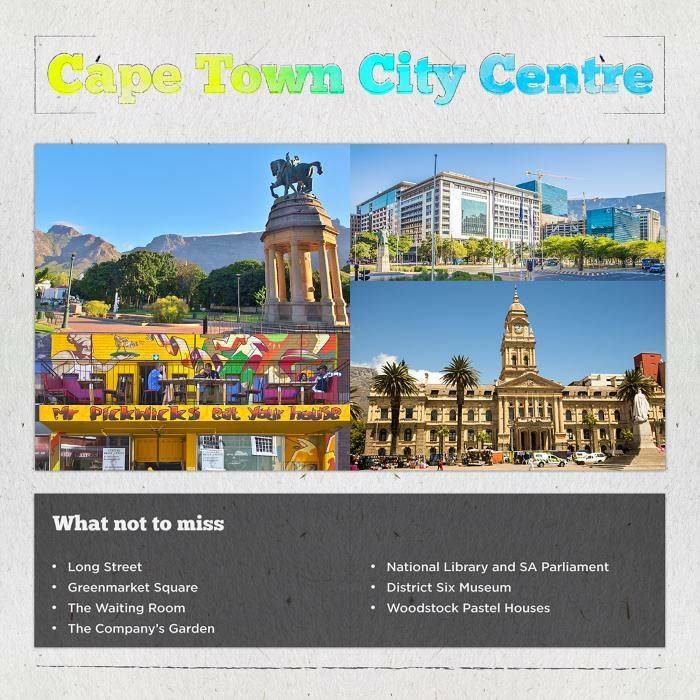 A converging of cultural influences that entertain all five senses, the centre of Cape Town is a colourful collection of architecture, gathered around the iconic Long Street. Hosting many of the city’s museums, restaurants and ornate buildings, the City Centre beckons visitors for laid-back wandering and cultural stimulation. To celebrate this, the first Thursday of every month sees the centre’s galleries and museums stay open late into the night, offering locals and tourists the chance to explore the streets and exhibitions in a chilled evening setting. Long Street – Colourful, pulsating and overflowing with life, Long Street is the beating heart of the city centre, lined with an incredible array of restaurants, independent shops and bars housed in stunning Victorian buildings. Greenmarket Square – One of the city’s oldest public spaces, Greenmarket Square is now a heaving tangle of stalls and local craftspeople selling their wares, surrounded by 300 year-old architecture. The Waiting Room – A secret hideaway tucked above The Royale Eatery, this venue offers incredible views of Table Mountain from its effortlessly cool terrace. The Company’s Garden – An elegant botanical garden that serves as a stroll back in time – it formerly provided fresh produce to South Africa’s arriving colonies and the Dutch East India Company. District Six Museum- A thought-provoking collection of exhibitions, offering an honest portrayal of the city’s converging cultures and communities of the District Six area. Woodstock’s Pastel Houses – A little way from the hustle and bustle of the centre, the neighbourhood of Woodstock is well worth a visit, if only for a wander through its picturesque streets of pastel houses. National Library and Parliament of South Africa – Within a stone’s throw of each other, these majestic buildings are among Cape Town’s most prestigious landmarks. An explosion of simmering colour, sunshine and general good vibes, Bo-Kaap is famous the world over for its technicolour dream streets and rich, Asian-infused culture. Formerly known as the Malay Quarter, Bo-Kaap has flourished into one of the city’s most iconic areas, and is a living, breathing patchwork of the confluence of cultures that makes Cape Town tick. Exploring its cobbled streets is a treat for snap-happy visitors, what with the melange of Islamic and Indian architecture rendered in a kaleidoscopic mix of hues and textures that Instagram can’t get enough of. The Multi-Coloured Streets – Exploring Bo-Kaap is much like walking through a rainbow, with its many varied shades happily existing side by side. Auwal Mosque – Commissioned by an Indian prince in 1794, this mosque is arguably the most breathtaking of Bo-Kaap’s many. 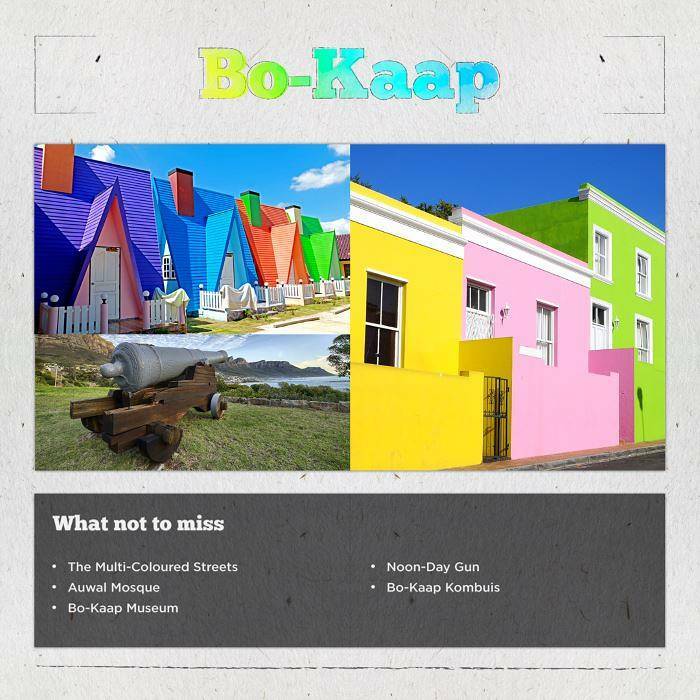 Bo-Kaap Museum – This museum is based around the depiction of a typical Muslim family living in Cape Town, and is set up to resemble a family home. Noon-Day Gun – Stemming from the coup of English colonies over the long-standing Dutch ones in 1795, a cannon has been fired every day at noon since 1806 and is one of the city’s longest standing traditions. Bo-Kaap Kombuis – The best place to sample Cape-Malay cuisine in the whole of the city, this homely restaurant has been serving up amazing dishes for years. Tucked just behind the bustling City Centre is the fittingly leafy Gardens district. A tranquil and calming break from the sometimes frenetic streets of Bo Kaap and the centre, Gardens is understatedly home to many of the city’s landmarks, and offers serene strolling along its blooming avenues. 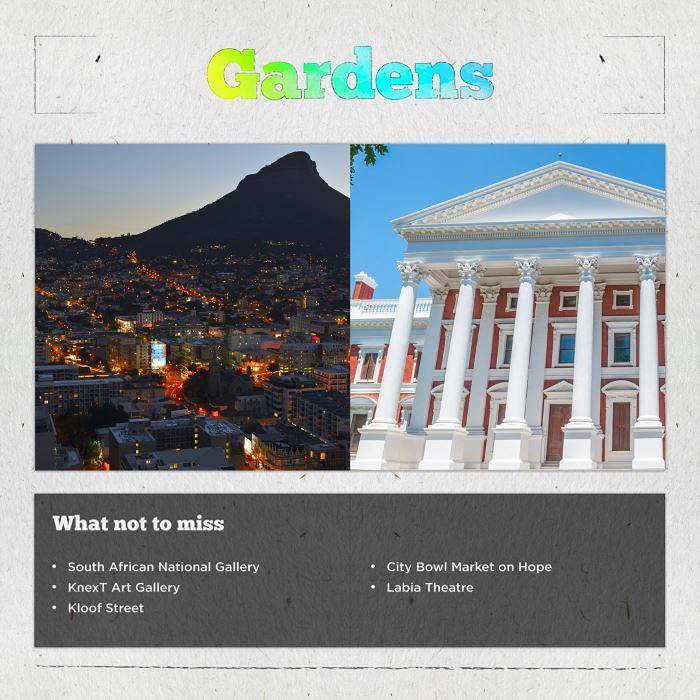 Because of its quiet atmosphere and proximity to the City Centre, Gardens is a great base for families and those looking for a more laid-back experience of Cape Town life. South African National Gallery – A vibrant collection of modern art with endlessly changing exhibitions, covering everything from photography to textiles. KnexT Art Gallery – Well worth a perusal, this eco conscious gallery is brimming with locally made artisanal products and the art of Modern Africa. Kloof Street – Cutesy cafes and quirky restaurants line this unassuming street – try the Bombay Bicycle Club for incredible Indian eats, Arnold’s for a selection of unusual, gourmet meats, and Kloof Street House for good grub in an elegant setting. City Bowl Market on Hope – A cluster of fragrant stalls selling all manner of tasty treats. Labia Theatre – A Cape Town institution, the Labia Theatre is a small independent Picture House. Undulating along the coast from Bantry Bay to Mouille Point, this beautiful stretch of coast is one of Cape Town’s most ruggedly picturesque, and is a welcome playground for hikers, bikers, watersports fans and indeed all lovers of a scenic stroll. With dramatic ocean views, a relaxed, seafront vibe and thriving artistic scene, Sea Point Promenade is a great neighbourhood in which to while away a day and watch as the sun sets over the horizon. Promenade Monday Socials – The start of the week sees Sea Point come alive as the sun sinks, playing host to all manner of wheels, from bikes and skateboards to rollerskates and unicycles. The Promenade Walk – Walking the 11km of the promenade is a must for fans of the great outdoors and spectacular views. 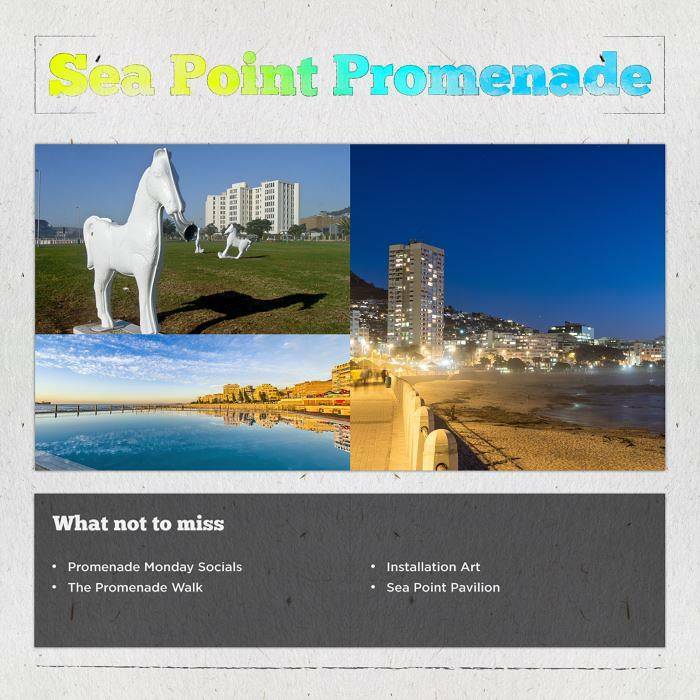 Installation Art – Owing to its crowds of locals and visitors alike, Sea Point Promenade has become a prime spot for local installation artists to showcase their latest works amongst regular fixtures, including a elegant white horse and giant pair of Ray Ban sunglasses. Sea Point Pavilion – Said to be one of the most beautiful outdoor pool complexes in the world, It’s well worth taking a dip here. The pools offer a way to have a quick splash about without freezing the proverbials as the pools here are generally at least 10 degrees warmer than the nearby ocean. A lively and popular suburb just a short walk from Cape Town’s City Centre, Camps Bay is a beachside paradise heaving with good food, friendly bars and ocean views, with the Twelve Apostles Mountain Range as its spectacular backdrop. Perennially popular with holidaymakers, surfers and beach-bums in general, Camps Bay offers endless elegant sidewalks and promenades to waft up and down, and hours of rolling surf to dip in and out of. Camps Bay Restaurants – Offering a truly staggering array from the smallest local eateries to high-end dishes, Camps Bay’s restaurants are a must-try. Hussar Grill is top of the charts for incredible steaks, Paranga for local fare in an oceanfront setting and The Roundhouse for truly haute cuisine and fine dining. 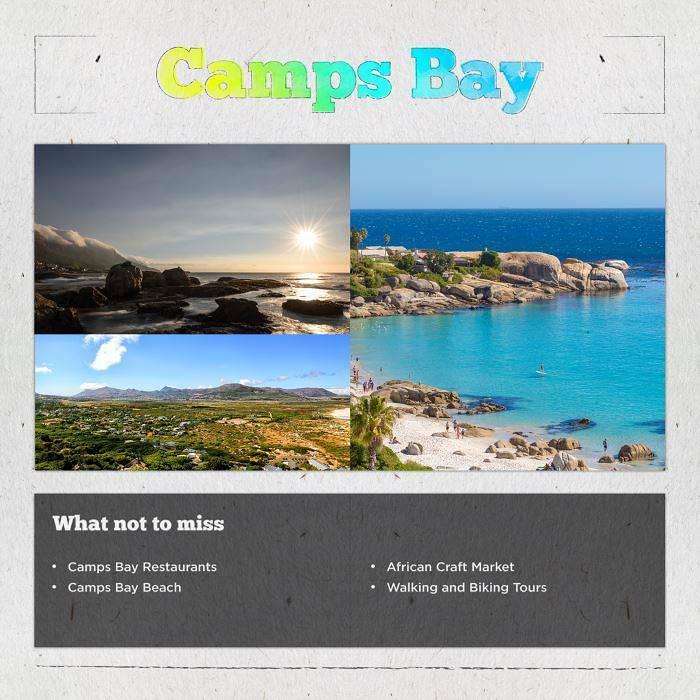 Camps Bay Beach – Playing host to an endless procession of watersports enthusiasts, burly surfers and relaxing families, Camps Bay Beach is one of Cape Town’s best. African Craft Market – Found along the incredibly picturesque Victoria Road, this market is one of the best places to find locally produced, traditionally crafted souvenirs and curios. Walking and Biking Tours – The greatest way to soak up the Camps Bay vibe is to walk or cycle through it – various tours for all abilities run daily. Hugging Cape Town’s eastern coast, these two neighbourhoods are the mainstays of the sweeping False Bay area. 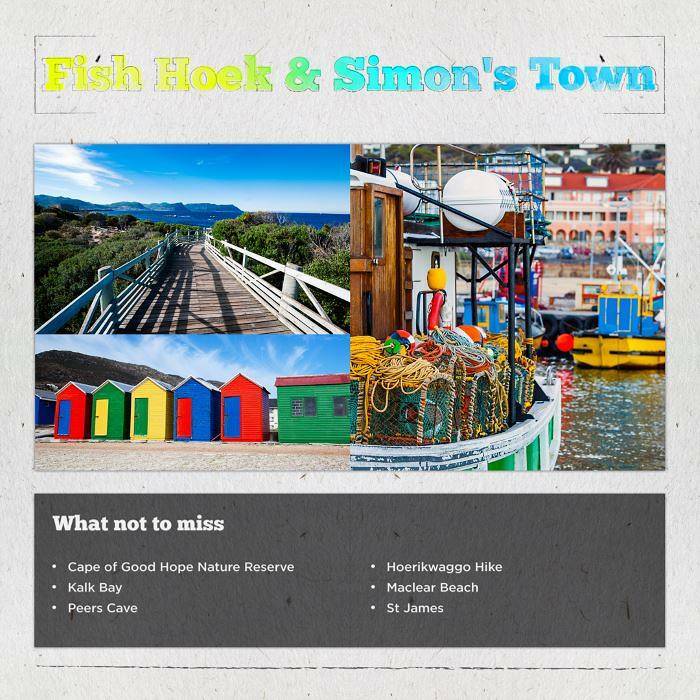 What Fish Hoek and Simon’s Town lack in terms of proximity to the City Centre, they more than make up for in quaint aesthetic and small town charisma. Simon’s Town boasts much of the original architecture that categorised its Victorian era creation and is brimming over with excellent restaurants and bars, whilst Fish Hoek offers seaside charm by the bucket (and spade) load, with white sand beaches and colourful Victorian bathing houses. Cape of Good Hope Nature Reserve – Half an hour’s drive from Simon’s Town, Cape Town’s famously breathtaking natural wonder is easy to explore, home to zebra, baboons and antelope. Kalk Bay – A cute seaside village overflowing with antique shops and quaint cafes. Peers Cave – A Stone Age cave, home to the remains of the 12,000 year old ‘Fish Hoek Man’. Hoerikwaggo Hike – One of the best hiking trails around Table Mountain. Maclear Beach – A picturesque and secluded beach. St James – Set against the mountain range with incredibly pretty beaches, St James is a hidden gem, scattered with colourful beach huts and holidaying families. Gracing the Atlantic Seaboard, Hout Bay is a vibrant coastal town with a sun-soaked harbour and some of the best fish and chips in the country. 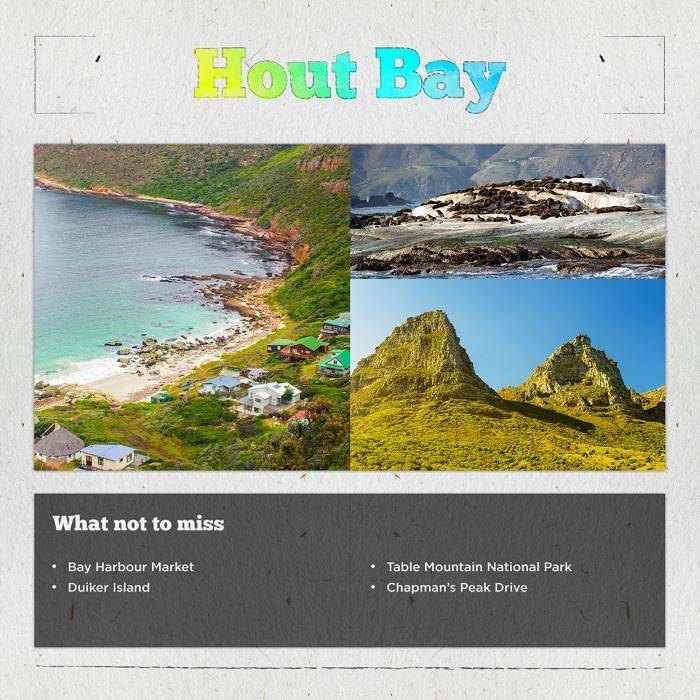 With a bustling, vibrant market at its centre, Hout Bay is surrounded by rugged cliffs, windswept beaches and endless little trails, making it an incredible Cape Town base for outdoor lovers and those in search of a South African adventure. Bay Harbour Market – One of Cape Town’s busiest and most popular markets, housed in an old fish factory. Chapman’s Peak Drive – Known locally as ‘Chappies’, this 9k road hugs the Atlantic Ocean from Hout Bay all the way to Noordhoek and is ideal for cycling or a scenic drive. Duiker Island – Taking a cruise to this ocean-lapped island, home to a colony of Cape Fur Seals, is a must-do for every visitor to Hout Bay. Table Mountain National Park – An outdoor adventurer’s paradise, Table Mountain National Park offers endless stunning scenery, hiking trails and abundant wildlife. Surrounding the incredibly preserved Old Wynberg Village, an urban conservation area and beautifully distilled window into the past, Wynberg is a clustered collection of historic cottages, buildings and village shops that feels a world away from the contemporary bustle of Cape Town City Centre, or the vivid colours of Bo-Kaap. Wandering Wynberg’s streets is a great way to get in touch with yet another facet of the city’s past. Old Wynberg Village – An urban conservation area, housing cottages, churches and other architecture dating back to the 1800s. Chart Farm – An idyllic escape from city life, Chart Farm allows visitors to pick their own roses whilst overlooking the rolling vineyards of Constantia. 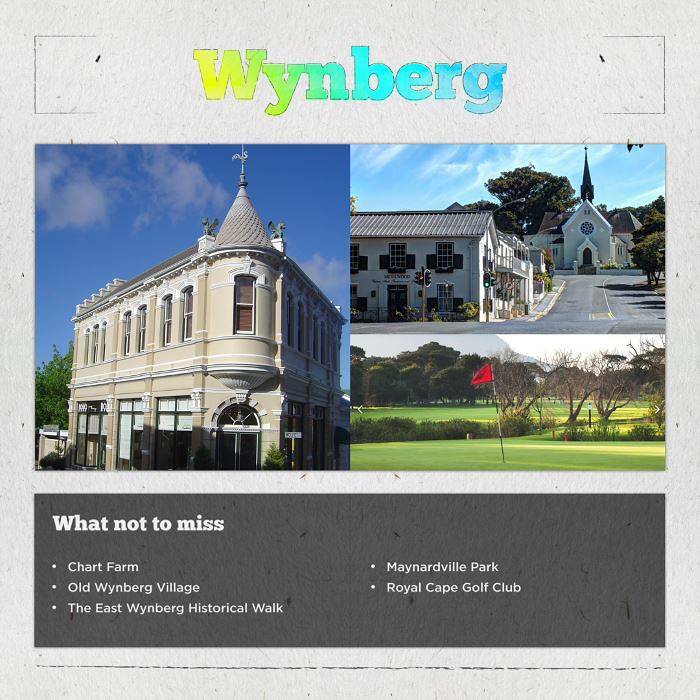 The East Wynberg Historical Walk – A specially produced walking tour of Wynberg’s most historically significant buildings. Royal Cape Golf Club – South Africa’s oldest and most prestigious course, the Royal Cape Golf Club is framed by the beautiful Table Mountain Range. Maynardville Park – A leafy and serene oasis, this beautifully manicured park plays host to numerous art, drama and musical performances within its outdoor theatre. Want to explore Cape Town’s neighbourhoods for yourself? Start by comparing prices on holidays, flights, hotels or car hire.